Herb the magician’s rabbit loves the attention, the applause, and the carrots that are thrown on the stage every night by his adoring audience. 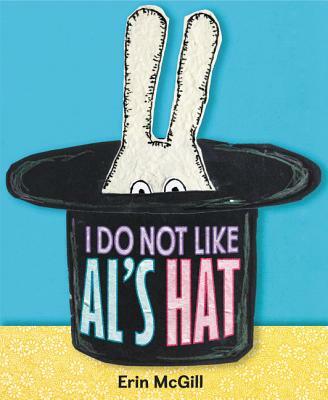 But Herb does not like being stuffed into Abracadabra Al’s hat and—Presto!—being pulled out by his ears. Ouch! Erin McGill was born and raised in New York City. She spent much of her time as a child taking classes at the Bronx Zoo. After realizing that becoming a zoologist required too much science, she decided she would rather draw the animals. She received a BFA in illustration at Pratt Institute, where she discovered her love of patterns, textiles, and collage. Erin McGill creates greeting cards, toys, and wearable art, and for years has sold her work from a sidewalk cart in Soho. She lives with her husband in New York City.